In short, in 1943, German generals favored a ‘wait-and-see’ approach to the Soviets, to let them make the first move, then react with Panzer and other mobile forces to cut them off and destroy them. This tactic was highly successful to date, such as just before the opening of Case Blue the year before, and in the fighting for Kharkov shortly before this major engagement. However, Hitler of course did not favor such a thing, insisting on an operation that would take the initiative away from the Soviets. Thusly, Operation Citadel was born. In this plan, the Germans would pinch off the very large Soviet sailent surrounding Kursk, hoping to cut off massive amounts of Soviet troops. The problems surrounding this plan were numerous. Firstly, the Soviets weren’t stupid, and saw this coming, building up massive reserves and thick, miles-deep defensive lines along the shoulders of the salient. For another, the Germans were very weak in infantry and artillery, perhaps short close to a half a million soldiers throughout the Eastern Front. And, as usual, the Germans totally underestimated the extent of Soviet fortifications and reserves, so when the time came, the offensive barely lasted 11 days before Hitler called it off, withdrawing the valuable SS Panzer Corps and sending it to Italy to deal with Allied landings there. After the large losses suffered by both sides – which the Soviets could replace, bu the Germans could not – from this point forward, the Germans were on the defensive in the East until the end of the war. The Battle of Kursk was the end of Germany’s fortunes in Russia. 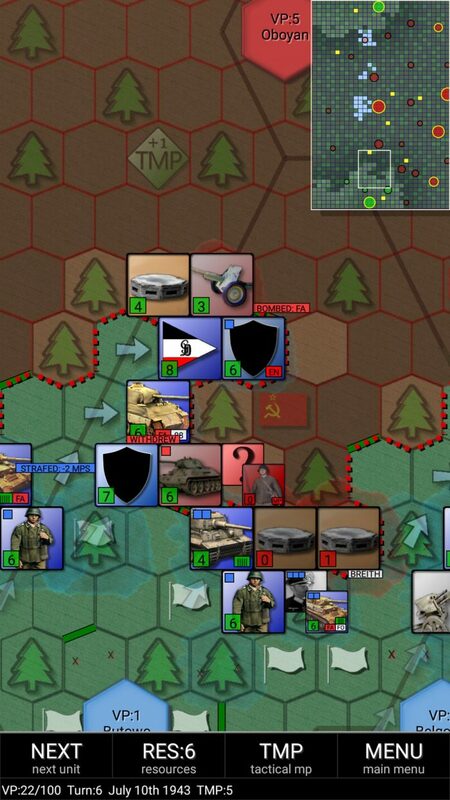 The overview map for the game shows Kursk at dead center. 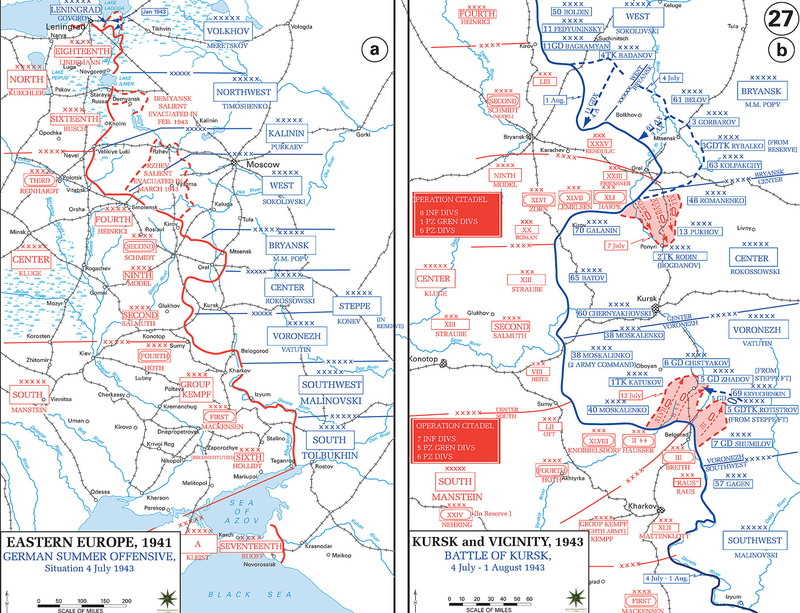 The western front of the bulge is probably just barely off the western map edge, and the shoulders of the Kursk salient are clearly visible, as are the German’s starting positions. 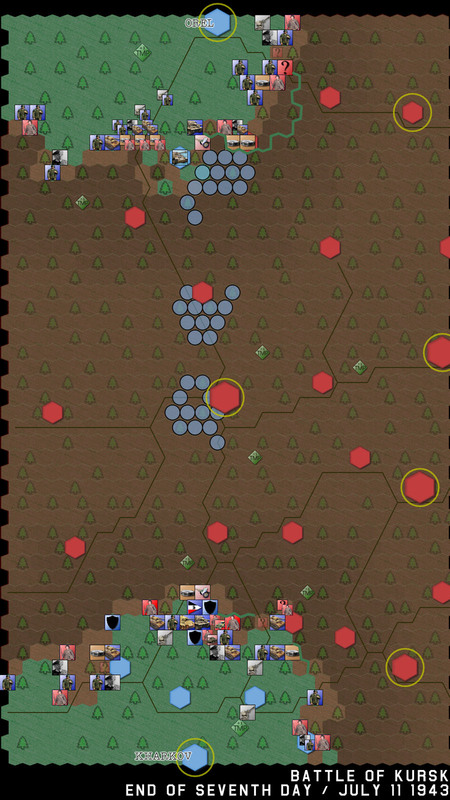 I created a large map using individual screenshots and piecing them together, to help illustrate the game better. 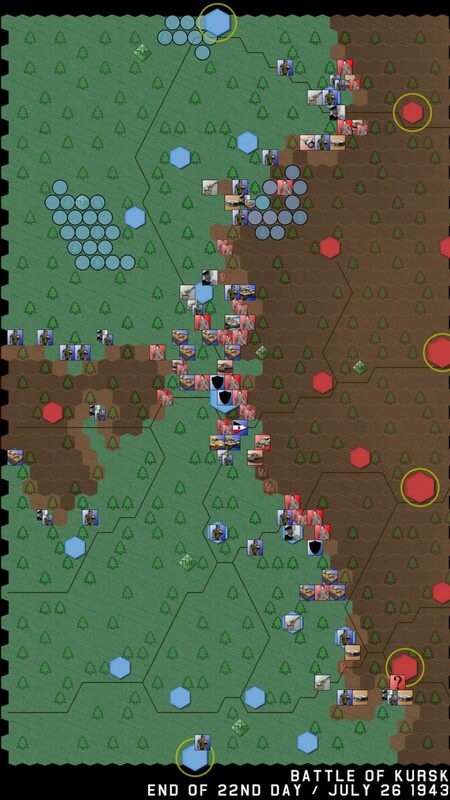 In this image, you see the German starting forces along the northern shoulder. I don’t know offhand if these are all of the German forces that served in the northern shoulder or not, but doing an OOB analysis seemed way out of scope for this article, and I’ve already kind of gone off the rails with some of the things I’ve done for it. Up here, the Germans start with 12 Infantry Divisions, five Panzer Divisions, and one Heavy Panzerjager Battalion, plus various artillery. Artillery fire can remove movement points (MP) from a targeted enemy, or could possibly reduce them by a number of Hit Points (HP). They could also be ineffective, a result which unfortunately happens at the most inopportune time! The blue dot(s) in the upper left corner of the counters represents MPs; each is one MP. The number at lower right is the HPs of the unit. Leaders, portrayed as various German generals, are represented in this northern area by four (Kluge, Harpe, Lemelsen, and Jaschke). They have four MPs and can therefore move fairly quickly, but they can also pass along one MP (at a cost of three MPs to themselves) to a unit in their same hex. They can also influence combat; the closer they are, the better the bonus, and each such battle removes one of their MPs. The southern part of our offensive looks a lot stronger, especially as it has the three SS Panzer Divisions present. In total, there are only eight Infantry Divisions here, but there are five Panzer and three SS Panzer Divisions, as well as the Grossdeutchland Panzer Grenadier Division. Additionally, there is the 39th Panzer Regiment and the 503rd Heavy Panzer Battalion. Finally, there are several Artillery units and three Leaders (Manstein, Hausser, and Nehring). We’re ready to begin our offensive. Let’s begin. The Soviet defensive positions are substantial, and the movement ability of the Panzers is fairly limited, so there will be no lightning strikes. As you saw from the initial deployments, there are more than a few Soviet rifle divisions, anti-tank positions, and bunkers in place; those are just the ones we can physically see at the moment. 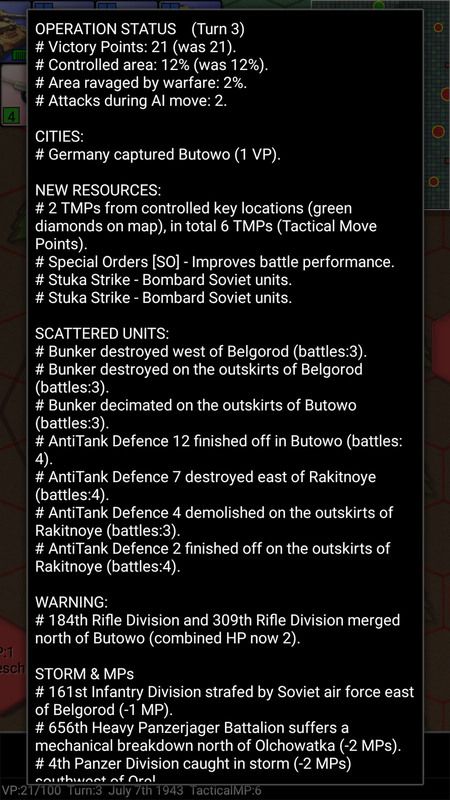 I don’t have a real plan, here; Kursk is pretty much the objective, with the destruction of as many Soviet formations as possible a very close second. We won’t win the game unless most of the map is cleared, and quite honestly, if that happens the situation on the Eastern Front will have changed dramatically. At the end of the first day, we’ve barely made any progress. 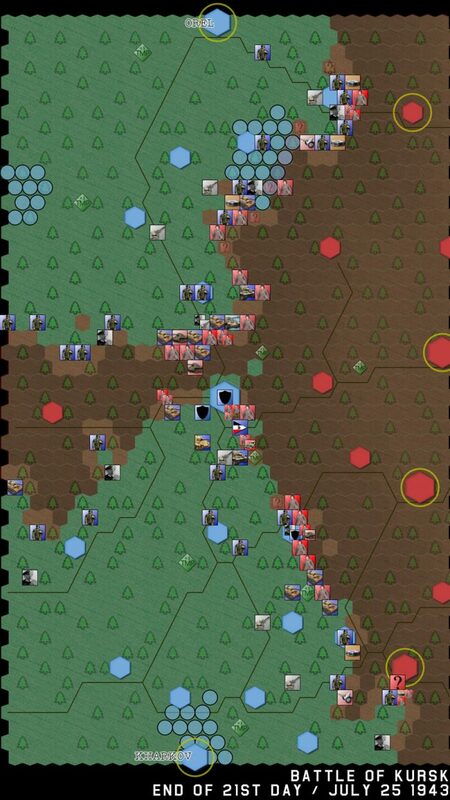 There are far too many Soviet fixed defenses to overcome initially, but we manage to weaken several Soviet formations with little loss; I think one of my southern Infantry divisions took a hit assaulting a Soviet bunker, dropping to 5 HP, but otherwise everyone is intact. Fatigue is bound to go up, though. Each unit – on both sides – gains Fatigue the more it moves and fights, and this value is expressed as a percentage. Once it hits 80%, a red FA icon appears on the unit, warning that it’s about had enough and really needs a rest. In the north, we make a little more progress; the 9th Panzer Division makes the deepest penetration in the Russian lines, with the 102nd Infantry Division further west doing the same. However, the 9th is in danger already of being cut off by the two Soviet formations flanking it (the 140th and 162nd Rifle Divisions), though both of those divisions are bloodied (down to 2 HPs out of 6) and have lost a lot of their mobility. In the south, we captured Butowo and generally made good progress, although that’s mostly due to our strong Panzer formations there. I fully expect Soviet reserves to arrive tomorrow or the next day at the latest. At this point it might help to give you an idea of how far the Germans managed to get historically before calling the offensive off. 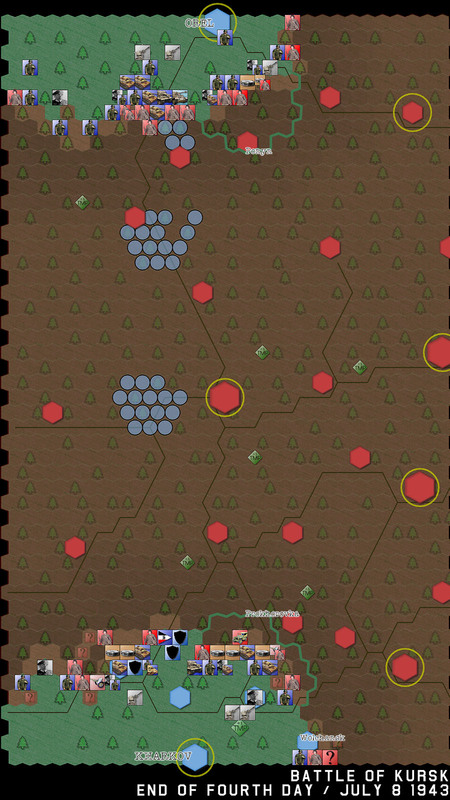 I tried to indicate their historical limit of advance against the game map, here. I’m approximating. 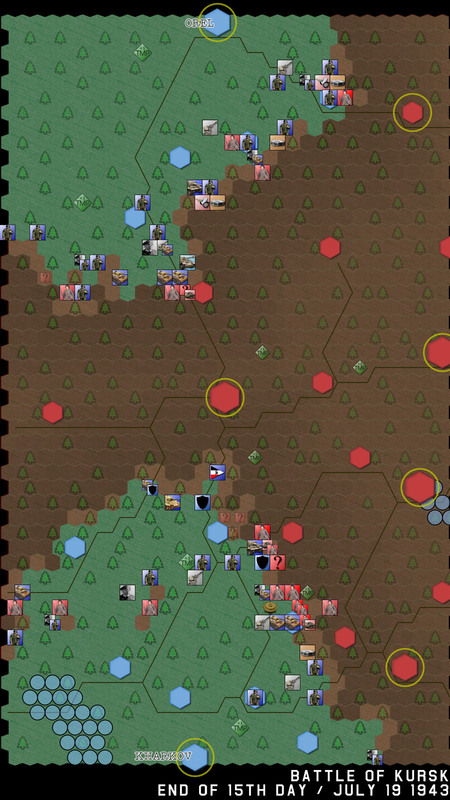 The game map is different in scale from the real-world map, but that’s due to programming. It still does an excellent job of approximating the game map and the objectives. The Operation Status report appears at the start of every game turn. You can get a good idea of what happened since Turn 2 here. From a cursory glance, our VP (Victory Point) total has not changed; we need 100 VPs to win the game and we’re at 21 right now. Under the ‘Scattered Units’ heading, you can see we’ve fairly well ripped apart the initial Soviet defenses; several bunkers and antitank defenses have been decimated, though we still haven’t seen any Soviet tank units. Yet. 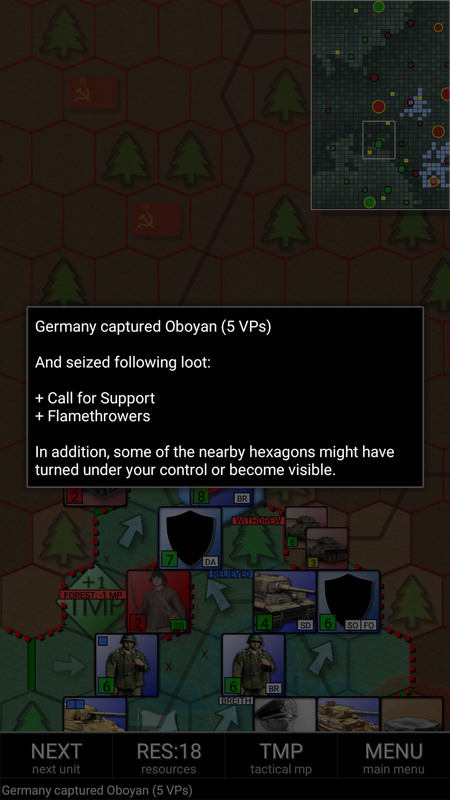 Each turn, the Germans get a limited number of resources. What you see in this screenshot indicates what we have on hand currently, but not what we earn from turn to turn. 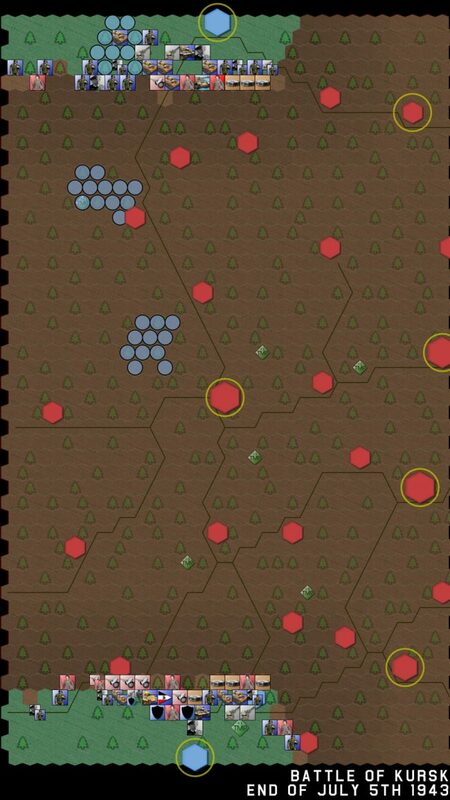 Usually, we will get additional resources as we capture enemy locations; otherwise, they will be a trickle during the game. Honestly though, if we’re not capturing locations, we’re not winning, and any number of resources won’t help us win at that point. I’m just going to show the actual advance historically (green line) versus the current advance. We’re doing pretty well, but we’re being held up by a line of Soviet bunkers in the eastern part of our northern advance. 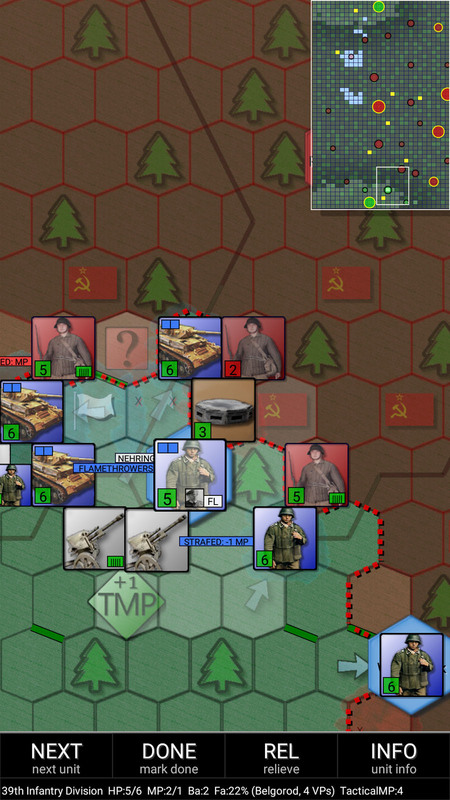 In the west, we managed to isolate a Soviet Rifle Division the previous day and have reduced it to nearly its component atoms, though there are plenty more Soviet units to play with those two German Infantry Divisions out there. 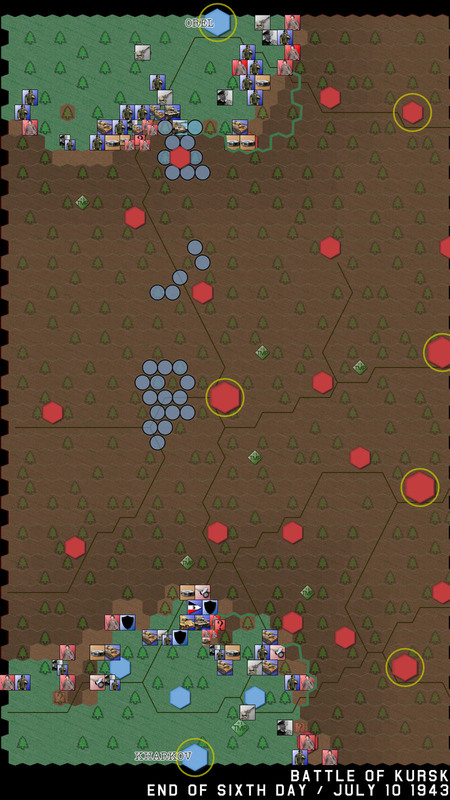 Our Panzers have managed to start to drive a wedge in the center. We’ve made excellent progress in the south. We captured Wolchansk, on the eastern edge of our salient, and are on our way to capturing Prokhorovka, which eluded our historical counterparts. 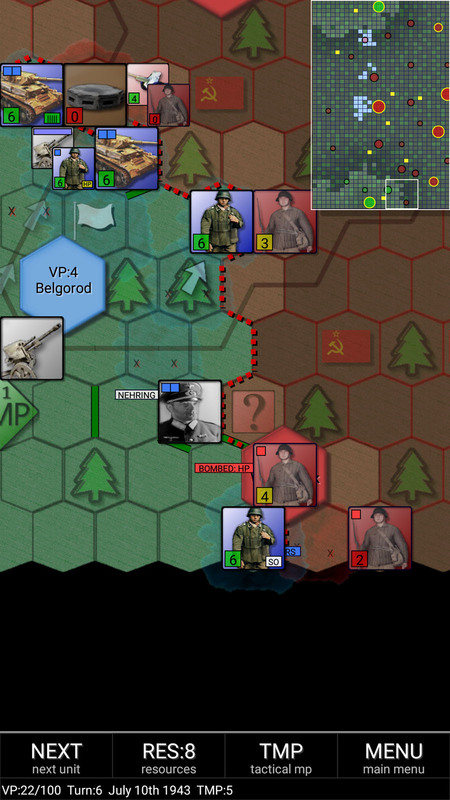 We’ve apparently also ‘liberated’ several other hexes behind Soviet lines, though this happens sometimes in Conflict-Series games and is not indicative of panic or rear-area commandos. We continue to make good progress in the south; both the 2nd SS and 3rd SS Panzer Divisions have broken a hole in the Soviet defenses, and are joined by the Grossdeutchland Panzer Grenadier division, and are poised to make a dash north (though I have no illusions that the enemy will meet them quickly!). In the north, we’re making excellent ahistoric progress in the western part of the salient as our Infantry Divisions crush all Soviet opposition via careful maneuvering and mutual support. 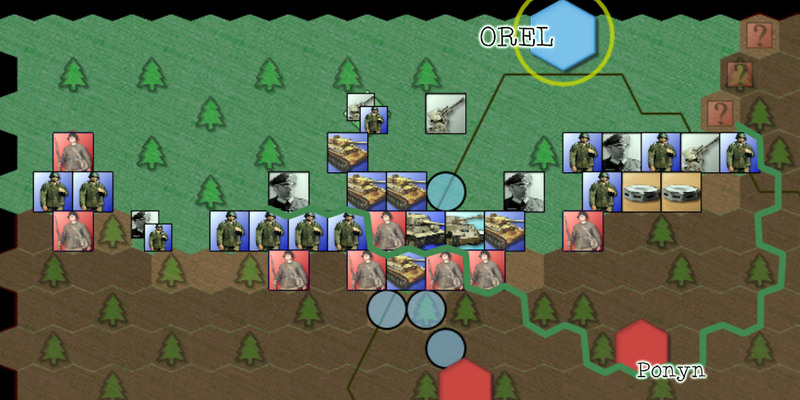 On a final note, at the end of Day 4, the 6th Infantry Division appears in Orel (in the northern sector) as a reinforcement. They’ll come in handy to help stem the tide of Soviet divisions attacking the eastern part of our salient there. I also decided to divert the 18th Panzer Division to the eastern part of the northern salient, to support our Infantry Divisions there. Storms are starting to affect our movements and are bogging down our Panzer units. We’ve advanced our VP count to 23, but there’s still a long way to go. We’ve broken through the Soviet defenses in the south the previous day; 3rd SS Panzer Division (Totenkopf) races ahead and runs into an unknown Soviet formation, which it rushes into battle against and manages to hurt it so thoroughly that the Soviet unit disappears from view. 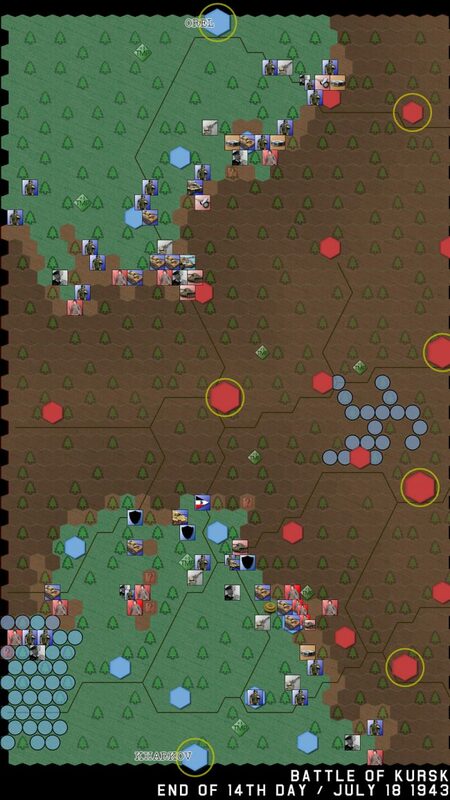 They’ve run into more antitank defenses, but only one lone unit, which shouldn’t be much of a match for our units (as long as I attack them carefully, with support from other units, and not alone). The Soviets recaptured Wolchansk, on the eastern edge of our southern sector, but that’s only because the 282nd Infantry Division is maneuvering, trying to keep Soviet units out of our salient. 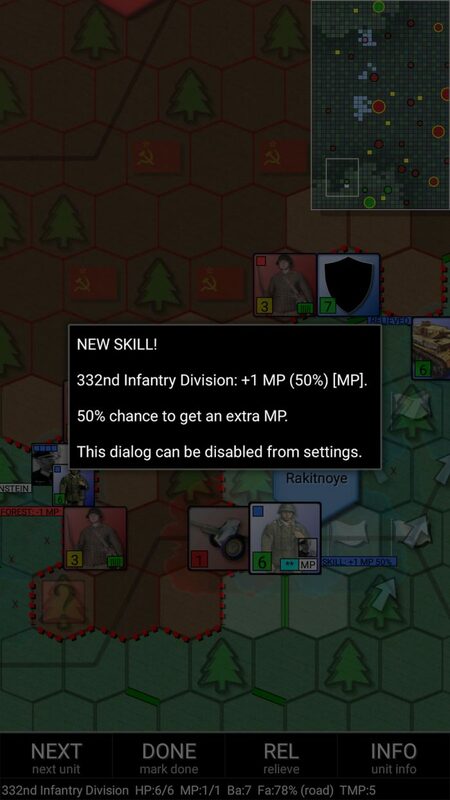 I’m sending artillery support and will send any future Infantry Division reinforcements to that area to help them advance instead of just keep back the Soviets (which is a great win for the moment, actually). General Nehring is heading out there, too, to provide support. After a Stuka Strike and a determined attack by the 282nd, the Soviet’s 270th Rifle Division is still entrenched in Wolchansk, though at reduced strength, while the German unit hasn’t lost any HP (thankfully). 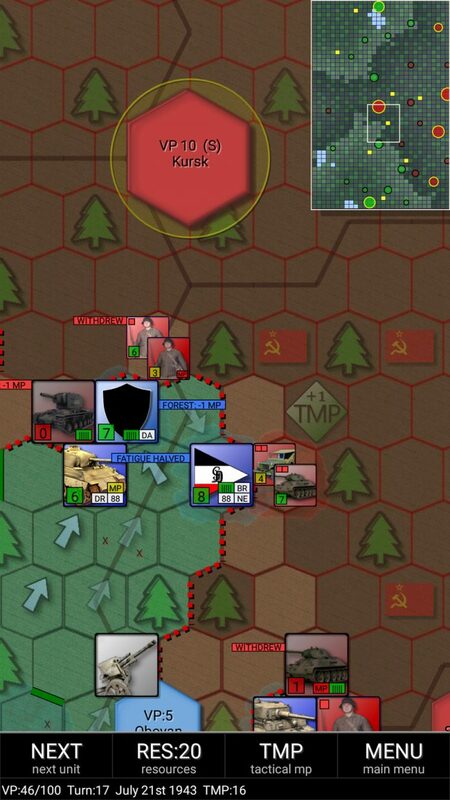 At the tip of our breakneck Panzer advance, the Soviet 31st Tank Corps arrives on the scene and temporarily cuts off the 3rd SS Panzer Division, which suffers a 1 HP loss from being encircled. This doesn’t last long, as Grossdeutchland arrives on the scene to re-establish a supply line, and the 39th Panzer Regiment, with an added Antitank Gun resource, breaks the 31st Tank Corps’ advance and causes it to retreat, though this exhausts the Panzer Regiment. The Tigers of the 503rd Heavy Panzer Battalion adds to the Soviet Tank Corps’ woes, reducing it to a shadow of its former self during the day’s fighting. Most of my Panzer units are getting exhausted, so that means resting them for at least a day to avoid them being on the losing side of some battles. 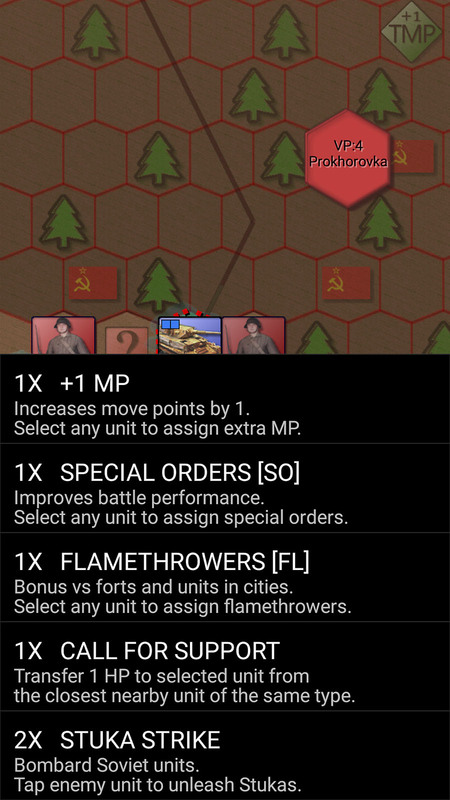 That, of course, gives the Soviets more time to assemble mobile reserves to stop my advance on Kursk. 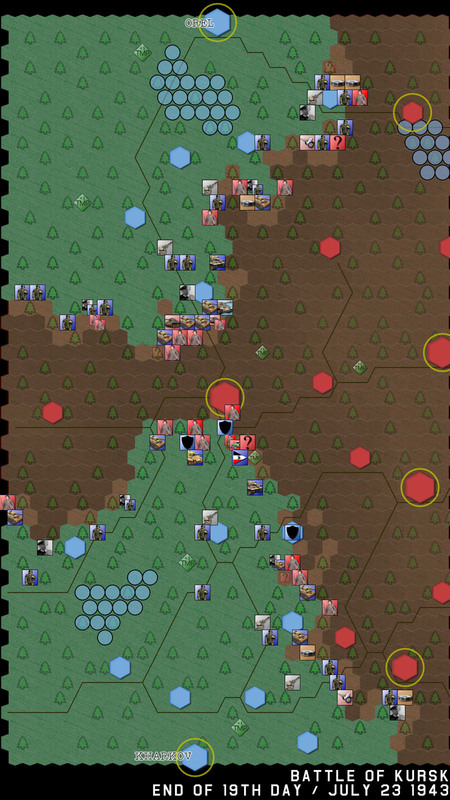 As units fight, they gain new ‘skills,’ which can impact their performance in the field. 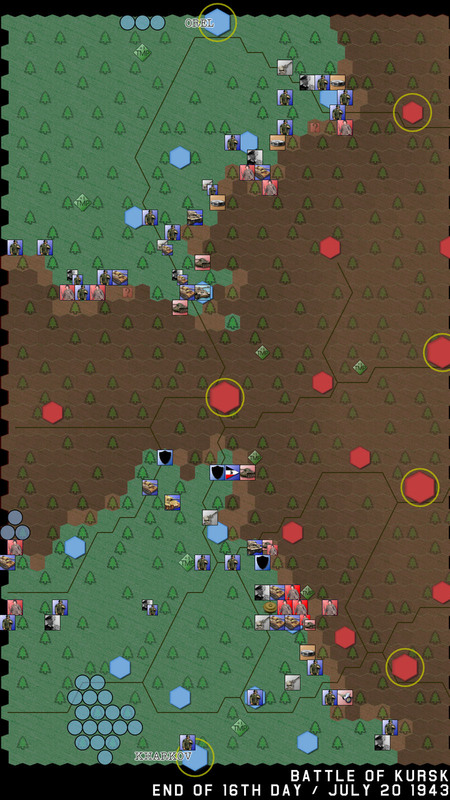 Here, you can see the 332nd Infantry Division has a 50-50 chance of getting one extra MP at the start of every turn, which will greatly increase its maneuverability. That never hurts. In the north, the 18th Panzer Division has advanced to the outskirts of Ponyri. Otherwise, not much has changed there. As you can see, we’ve pretty much managed to reach the German’s historical advance in the south here on D+6, which they achieved on D+11. 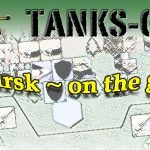 While the 3rd SS Panzer Division got a bloody nose from a Soviet Tank Corps, the Tank Corps was gutted almost immediately…though there will be more where that came from. In the north, we’ve not reached the historical advance line yet, but we’re making excellent progress on the western side of that salient, where the Germans were not able to (historically, anyway) make much of an advance. In the north, we’ve captured Olchowatka, which I don’t think the Germans did, historically. That’s a good step in our advance up there, but the Soviets are piling on the pressure on the eastern side of our salient there. Our advance has slowed in the south, but has picked up in the north. 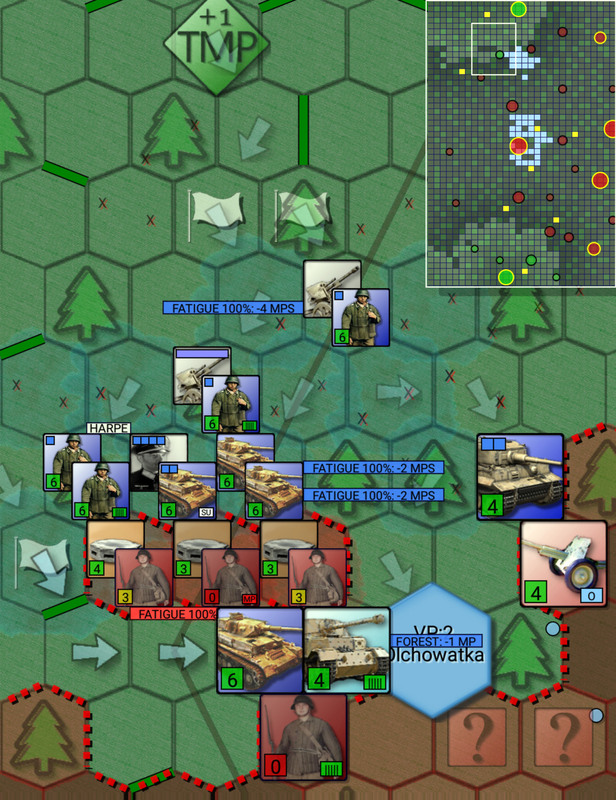 It’s difficult to not get our units bogged down with every Soviet unit that appears, but it’s very dangerous to leave them to roam freely behind the lines; encirclement is a nasty business in these games. So far, though, I think we’re doing a lot better than our historic counterparts. I can only imagine Stalin starting to panic and release even more reserves to stop the German tide. In the north, our fortunes continue to grow as 20th Panzer Division and the 656th Heavy Panzerjaeger Battalion link up, forming a pocket with six Rifle Divisions and several fixed defenses. None of them have any MPs and there’s no relieving force viewable nearby with MP, so the Soviets are about to lose a good chunk of their northern defenses! In the south, I’d opted to make my advance a bit broader by sending the 1st SS Panzer Division (Leibstandarte) and the 11th Panzer to the western part of the advance, to help the three Infantry divisions that are bogging down on that end of the salient. In the north, we’re beating back the Soviet advances on the eastern edge of our salient, thanks to several Infantry divisions. We’re pulling something similar in the south, with the arrival of the 168th Infantry Division as a reinforcement and the 161st Infantry Division coming to help the 282nd shore up the eastern edge. A Soviet Tank Corps appears where we’re weaker in the south, near the eastern edge. I diverted the 7th Panzer from the center mass to help support against any Soviet tank attacks that might be coming from that direction. Another Soviet Tank Corps appears on the other side of our southern salient, but the 3rd Panzer Division handles it well, with Stuka and resource support. The ‘biggest tank battle’ is starting to brew up, with more Soviet Tank Corps appearing in the field. So far, we’re handing the pressure and are giving more than we’re getting, but the Soviets have a tendency to have endless reserves, too, while we certainly do not. 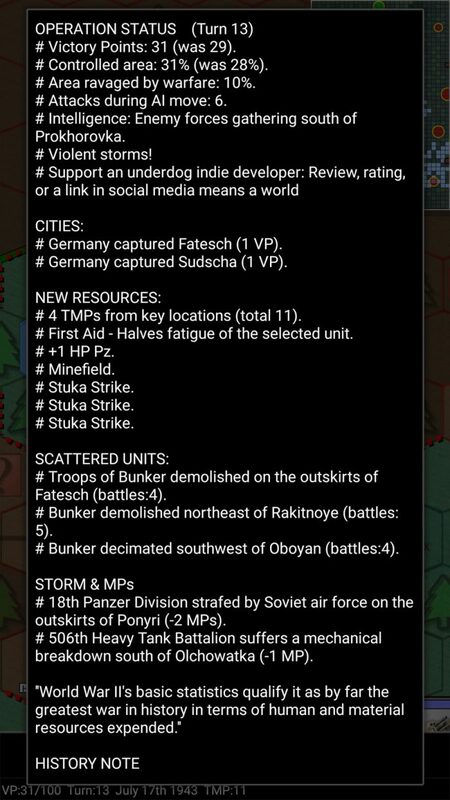 To heal damage, the Germans have to be lucky enough to have a ‘+1HP’ resource for the unit that’s damaged, and also the unit needs to be away from the enemy to receive it. 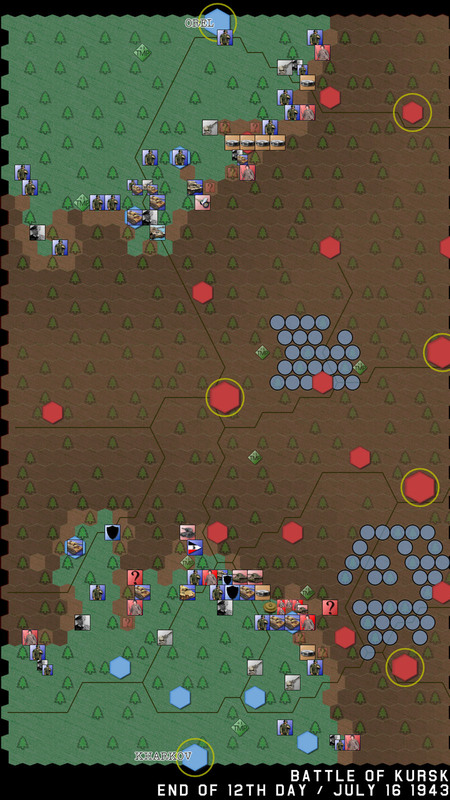 Otherwise, German units can heal in captured towns, as long as the town is a good distance from the front line (I think around three or more hexes away). At this point, we’re delving into ahistorical territory as the Germans called off their offensive at this point, and Hitler ordered the withdrawal of the SS Panzer Corps to Italy to fight the new Allied landings there. In my experience in this game, the SS Panzer Corps is not removed from the offensive, which is huge; without them I don’t think I’d be able to continue the momentum of the advance from the south. We’re upping our VP count, but still have a long way to go. The capture of Oboyan adds +5 VPs to our total, though, which helps a lot. We’re starting to take losses. 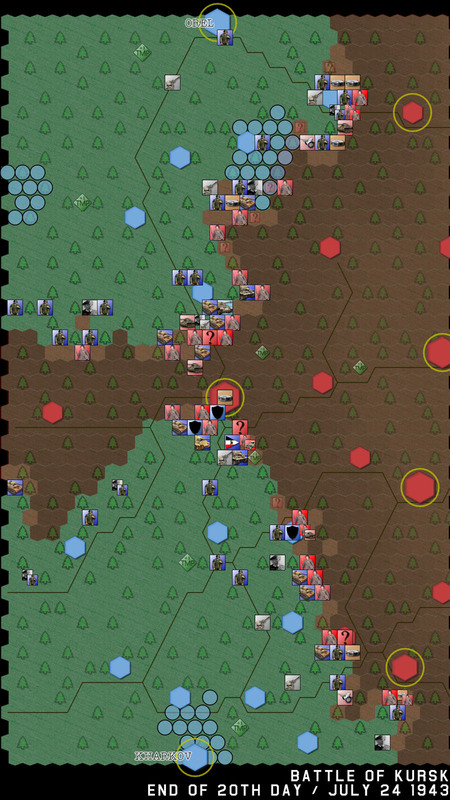 Specifically, the 39th Infantry Division is down to 4 HP, so I’m pulling it out of the southern line and will probably send it south to rest and refit. Otherwise, we are slowly approaching Kursk. At this point, I’m going to play through a few days to show significant progress or events. As you can see, we’re closing in fast on Kursk, but the Soviets keep managing to throw Tank Corps against our flanks. We might be able to take it, but might have them throw us right out, too. Day 17, and we’re closing in from the south. And…yeah, we’re still closing in. The Soviet reserves are proving tricky, but we’re not taking major losses while they are, and that’s what’s giving us ground slowly but surely. The 2nd SS Panzer Division (Das Reich) has made it adjacent to Kursk. It’s capture should come soon! Das Reich manages to capture Kursk the following day, exactly three weeks after the onslaught began. Success, in a way, though we have not won the scenario (technically) yet, nor have the northern and southern spearheads met. The Soviets go all out to try to push Das Reich out of Kursk, and they succeed, but only for a short time. The following day a renewed German offensive kicks them back out. 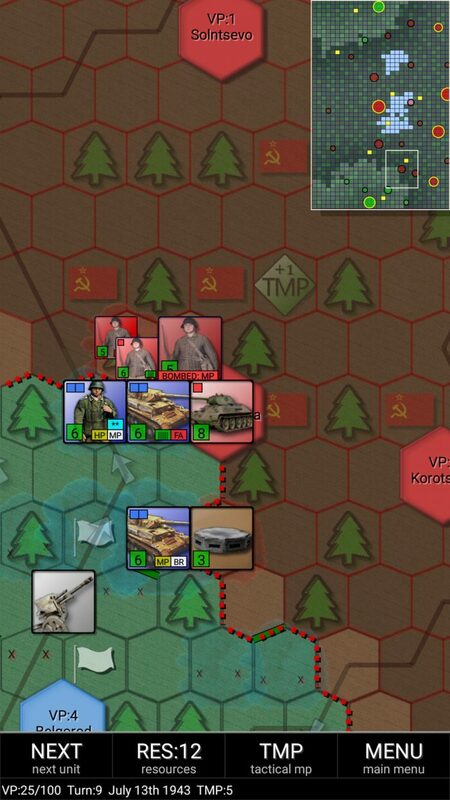 In the area the Soviets have strong units, including the 2nd Tank Army’s reserves and several Guards Divisions, but our plethora of Panzer units allows us to divide them up piecemeal and surround them. They surrounded more than a few of our Divisions during the night, but we were able to reestablish contact with each of them, before any automatic losses could take place. 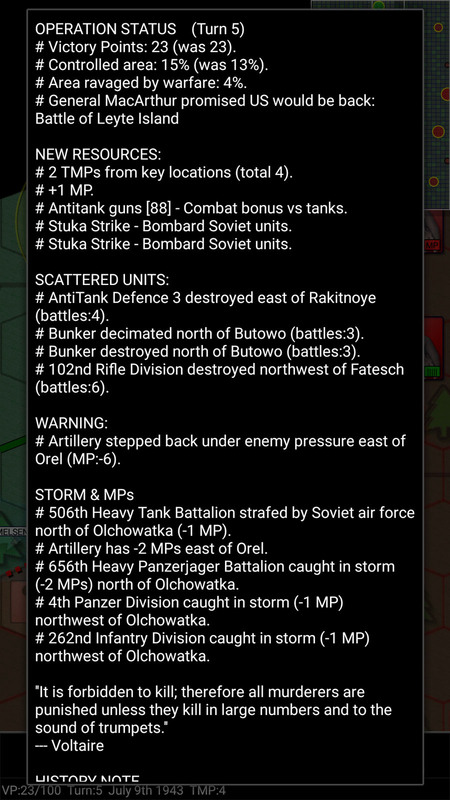 As you can see from the screenshot, the northern and southern offensives have met, which is but part 1 of the offensive; the other part is to clear out the entire map of Soviet units. 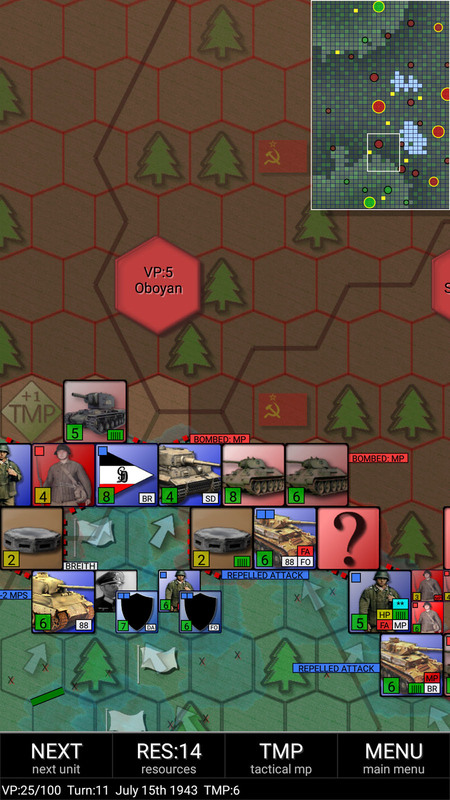 Clearing the map is difficult as the Soviets will continue to throw reserves and powerful Guards Divisions at us, so it’s by no means a cakewalk. But, capturing Kursk and having both north and south meet and establish a viable corridor (as we have managed to do here) is by far the biggest hurdle to get over. Needless to say, we’ve managed to perform a bit better than our historical counterparts, though as this is a game it stands to reason that there are, of course, a ton of imponderables that cannot be fathomed by a game for an Android phone. Still, Joni Nuutinen has done an admirable job of putting together and continuously supporting this series of games. 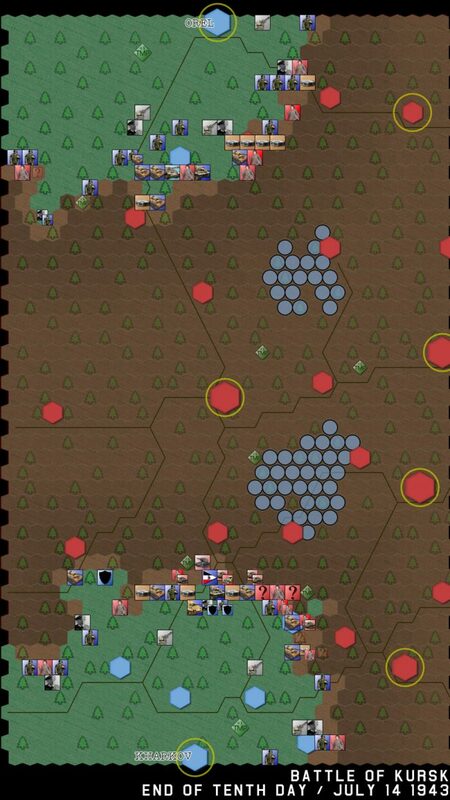 If you have an Android phone and love hex-type wargames, this is the thing for you. Go check out his free offerings in the Google Play store and, if you like them, buy the full versions. Kursk was not the biggest tank operation in the history and Prohorovka was far from being the biggest tank battle. The biggest battle happened actually somewhere near Smolensk in 1941 and the biggest tank operation was Bagration. Prohovka was actually quite small in figures. If I remember correctly in the vicinity there was only 600 tanks (including the likes of m3/m5 Stuarts and t60/t70). No Tigers and very few Panthers (if actually any) took part in the fightings at Prohorovka. From the KOVASS studies it looks like actual battle involved less than 400 AVC.